Which put a major damper on my plans to lounge by the pool all day… Better things are in store though! Last night I got home and had a package from Amazon.com, which had my gift from my birthday gift from my sisters! A Camelbak!! I’ve been wanting one of these for a while now because I hate holding a water bottle when I run, and my water belt can be a little much for shorter runs. But in the intense heat, water is necessary on any length run for me, so I couldn’t wait to get out and use it! I decided to go for a run even though it was SO hot last night, so I did a walk/run instead which seems to be my new thing. I ran for 4.25 miles, and walked just over 1 mile. I took .25 mile walking breaks 4 times during the run, so the longest stretch of running straight was 1.5 miles. I LOVED having my Camelbak because I didn’t have to worry about conserving water as I do when I carry a bottle, and it felt so light on my back I could barely tell it was there. My Garmin says I burned 575 calories.. woohoo! I should have planned better with my post run eats, becuase I had a peach and then just couldn’t think of what else I wanted, so I ended up grazing and just eating a bunch of stuff instead of a good, solid meal. I had an almond butter sandwich on wheat, lots of Dr. Krackers, and a bowl of Special K with soy milk. It doesn’t sound like much, but it was actually a lot and basically all carbs rather than having a balanced meal. Mental note to plan better for meals post workouts because I always end up grazing and eat too much when I don’t plan well. After seeing the gloom today, I decided to make myself brunch for one. I wanted eggs and pancakes, so I figured why not have both!? I made two mini protein pancakes, which were 2 points combined, with 1 tbsp pancake mix, 1/2 scoop protein powder, and 1 tbsp each of light soy milk and egg whites. Then I sauteed a green onion with kale over nonstick spray (0 pts) and put a fried egg (2 pts) on top of it. Then, for good measure, I had a small peach and an apricot (1 pt) from my farm share. This whole plate of goodness for only 5 points! What are you plans for today? Is it rainy/gloomy where you are? I’m going to get my nails done with two of my girls, Lianne and Rachel, and then going to a 4pm Bikram class with them. It will be Rachel’s first Bikram class ever so I am so excited for her. After that, we have the celebration for Lianne and my birthdays tonight, where we’re going out to a fancy dinner and then out to a few bars. I’ll be back tomorrow with a recap! Which kept me full for hours! I didn’t end up going out to get lunch until after 2pm, which is unheard of for me. I went to Devon and Blakely’s and picked up a salad to go. I like the salad bar there because there are so many options for add ins, but the salads can end up being pretty expensive if you don’t plan carefully and think about what you’re going to put in there. My salad turned out perfect and cost just over $7 so this is definitely a combo I’d do again. It had a spinach base, and then I added in chickpeas, blue cheese crumbles, roasted red peppers, and artichoke hearts. So delicious! I’m not blaming the salad, but after eating my lunch I started feeling a little off. My stomach was hurting and I just felt weird. I tried to drink some water because I figured it had to do with the heat, and then I went home after my day wrapped up. I was thinking about maybe working out since dinner wasn’t until 8, but I just felt kind of strange so decided to just take it easy and return a few of the birthday calls I got over the course of the day. And salmon ceviche, which was served with ikura and yuzu vinaigrette. But I only had one piece of the cucumber roll and Wil ate the rest. I started to feel a little better towards the end of the meal so we decided to order dessert and got banana tempura served a la mode (with ice cream) and had chocolate sauce and cinnamon. I topped them with 1 cup of sliced strawberries, for a total of 4 points. These really hit the spot and it felt great to have something stabilizing in my stomach. Lunch was at Teaism with my department, and I ordered the Veggie Bento Box. Which was actually way more delicious than I was expecting! Morning! Man, I was dreading coming to work today just because the weekend was so fun and definitely not long enough. The best way to ease myself into a Monday is to start the day off right with pancakes, which is exactly what I did this morning. When I was in NJ over the weekend, my dad took me to a blueberry farm where they grow, pick, and package the blueberries for distribution. You can go to the farm and buy the already picked blueberries for really cheap. We split a flat, which is 12 pints of blueberries, and it was $15 total. So, I got 6 packages of blueberries for $7.50, or $1.25 each! Fresh, delicious, plump blueberries for cheap!? Yes, please! You’ll be seeing a lot of them over the next week or so. I added the blueberries to the pancakes as soon as I poured the batter into the pan. 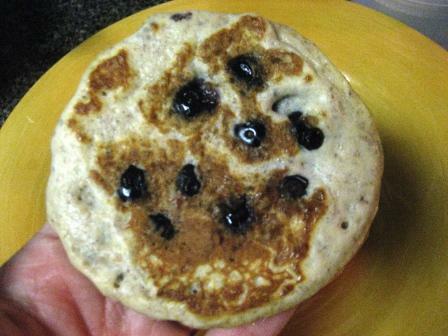 This recipe made 3 good sized blueberry pancakes. I took the rest of the cup of blueberries and microwaved them for 1 minute total which made them get all melty and pop into a delicious blueberry syrup. This made the perfect topping for the blueberry pancakes! These pancakes had just 4 points, syrup and all! I think I’ll be making more of this 1 ingredient syrup, which could be great chilled in a yogurt parfait or as an oatmeal topper. What is your favorite way to use blueberries? I need some ideas so I can make it through these before they go bad! Good morning and TGIF! I am soooo ready for the weekend, just have to get through today! Last night was really fun at the reception, but I didn’t end up doing THAT well with not drinking/healthy eating, though I didn’t bomb it either. It really helps not eating meat because they passed around a bunch of hors d’oeuvre that had meat on them, so I easily passed those up. I had two jumbo cocktail shrimp and two mini crab cakes from the passed appetizers. To drink, I had two glasses of Malbec and two vodka sodas, a bit more than I was intending. After the reception was over, a few of us finished our last drink at the bar and the waitress brought over some cheese and bread. I didn’t snap a picture, but there was some blue cheese, brie cheese, and a semi soft white cheese that I’m not sure what it was. It was all delicious and a nice treat! This morning I woke up and was craving one thing… pancakes! Chiacakes to be exact. I altered the recipe slightly to make it a little less pointy, and had 3 perfect pancakes with chocolate banana frosting! So 3.5 points for 3 pancakes! Then, to make the frosting, I heated up 1/2 small banana (1 pt) with 2 tbsp soy milk for 30 seconds in the microwave. The bananas got soft, so I mashed them with a knife and added 1/2 tsp cocoa powder (0 pts). It turned into a thick chocolatey banana frosting. If you wanted it to be thinner, you can add a bit more milk, but I liked it thick! I spread some on each on the chia cakes, and got ready to feast on a delicious breakfast. Soooooo good. I haven’t had pancakes in a while, so these really hit the spot! This frosting can be used for a lot of things, and it’s just 1 pt for all of it! Yum. So the total breakfast was 4.5 points, and super filling. I want more only because they were so good, not because I’m still hungry. What are you looking forward to most this weekend? I have a bachelorette tomorrow night in Atlantic City. One of my best friends is getting married in less than two months, so we’re going all out to celebrate! Good morning and happy Monday! 🙂 I actually have had quite a long morning (for me). I left my phone in my car yesterday after returning from errands, and didn’t realize until we were ready for bed that I didn’t have it. It was much too late to go to the car to get it, so I asked Wil (about 5 times) if he would set his alarm for me and make sure I woke up. I get really worried I’ll sleep in without an alarm (duh) and really only trust myself (barely, at that) to set the alarm right. So, my eyes opened at 6am and I was worried it was really late so I jumped out of bed and ran into the kitchen to check the time. I’m the type of person where, once I’m up and moving around, going back to sleep is nearly impossible, though I did get back in bed for another 30 minutes or so. I got out of bed (for good) at 6:30, went and got my phone, and decided to have a leisurely morning. I am feeling really, really sore today (probably worse than yesterday) but they always say day 2 after an intense workout can be the best. I wanted to stretch out and loosen up a bit, so I turned on ExerciseTV on Demand to see what was there. AM Yoga was missing so I looked around for something else that looked light, easy, and stretchy, and settled on Yoga for Beginners with Shiva Rea. It was a 25 minutes yoga flow series with lots of downward dogs, warrior 2s, cobras, and some other postures that I don’t know the names of. It was a little bit harder than I was expecting (I definitely broke a sweat!) but felt so good to stretch out my sore muscles and move around a bit. I let that sit while I through together lunch, and then used the skillet with nonstick spray to make 4 little chiacakes. I topped them with a sliced banana, and 1 tbsp real maple syrup. SO good. I haven’t had real maple syrup since… I can’t even remember when, and have had it on my list to buy for so long, but its just so expensive! I finally found some at Whole Foods (weird that I found it cheapest there!) for $4.99 (most places it was 7.99 – 13.99+ for a small bottle) so I took the plunge. 1 tbsp has 50 calories and sooo much flavor, so it was totally worth it. Definitely made these chiacakes a bit special. Though I don’t think I’ll make shooting out of bed at 6am a habit, it was really nice to get to take my time this morning and do some yoga before work! I even got to watch the Today Show while chowing down on breakfast, which is something I miss, so maybe I’ll get up a bit earlier on weekday mornings so I can take my time. Maybe. Also, Liz, who hosted the workout party on Saturday, posted a cute picture of the group, check it out here. Good morning! It’s Fridayyyyy! Woohoo! I looked at Women’s Health Mag’s Day 5 Tips for National Women’s Health Week and loved the tips because they are all about healthy weight loss, something I can totally relate to. The tips are very simple and straightforward, but I think its good to see them put out so simply to get back to the basics. Eat when you’re hungry! This one is a lot easier said than done, but obviously makes a lot of sense. You don’t want to limit yourself and not eat when you’re physically hungry, but you also don’t want to give into emotional eating out of boredom, sadness, happiness, etc etc. For me, this is a constant struggle. When food is in front of me, my impulse is to eat it whether I’m hungry or not. Recently I’ve been working on listening to my hunger cues, but also controlling my environment. If there are chips and salsa (or guac!) out, I will eat them, hands down. So, I try to either move away from the snacks (after having a few, of course) or just put them away if I’m at my own house. I’d love to have the self control to have them out there and just resist, but I’m not there yet. Be realistic. This is why I love Weight Watchers so much. I tried Atkins and was quite successful on the program, but gained back nearly all of the weight I lost once I started eating carbs again. Cutting out any food group is just not realistic longterm (for me – especially carbs! ), and you need to be able to make lifestyle changes, not just quick fixes. Weight Watchers is great because it helps you learn how to navigate certain social situations, gives you a supportive group of people who struggle with the same things you do so you don’t feel alone, and doesn’t have you cut out any one food group, even cake and sweets. I think being realistic is also super important in terms of time frame. The longer it takes you take off the weight, the longer it’ll stay off. I think having milestones or mini goals can be a good motivator to help you stay on track, but not if you’re going to set unrealistic goals and beat yourself up if you don’t reach them. My weight loss journey started in 2005 and I’ve been working hard and focusing on weight loss for over a year and am not even there yet (but am getting very close). Get moving. This one goes without saying. You don’t NEED to exercise to lose weight, but you do need to exercise to maintain weight loss, and to be healthy overall! It doesn’t mean you have to compete in triathlons or run for hours on end (see point #2 – be realistic!) but you do need to do something. Walking can be a good starting point for a long of people, but its good to change up your activity, and find something you love! And don’t be afraid to try new things – you might surprise yourself. I never in a million years thought I’d love running – I literally used to do anything in my power to avoid doing the mandatory laps at soccer practice when I was a kid and would call out sick during the day of the mile run in gym class. But for me, I love the challenge of running and even though I’ve had a brief hiatus from it recently, I’m happy to be back to it! What do you think about these tips? Any other big ones you think are important to be mindful of? I couldn’t decide what I wanted for toppings on the pancakes, so I did something a little different on each one! One with almond butter & banana, one with greek yogurt & strawberries, and one with coconut flakes & hershey’s syrup. I picked these up and ate them like tacos, as seen on Kath’s blog (except she actually cooked them in taco shapes, I made mine normal and just rolled ’em up!). I’ll use any excuse I can to eat with my hands. Do you see how thick and fluffy these pancakes are? The chia seeds soak up all the liquid (which is why I used more than normal today) and make for the fluffiest, most delicious pancakes. Morning and happy Tuesday! It’s gotten really chilly in DC and I am not loving it. Today is in the 50’s and is supposed to rain this afternoon/evening. Not ideal. I was planning on going for a ride or a run tonight, but I’ll have to play it by ear. I haven’t visited my gym in a long time, so maybe tonight is the night.. I mixed all those ingredients together and let it sit for 5 minutes while I put my lunch together. Then, I made it into 3 small pancakes instead of 2 bigger ones like I usually do (That had nothing to do with the fact that my bigger pan was dirty…) and I really like doing the 3 smaller ones. They cook faster and I just love having 3 pancakes instead of 2. These tasted just as delicious as they look! As I mentioned above, the texture the pancakes take on from adding the chia seeds is awesome. They get fluffier and a little chewy (in a good way) and take the toppings VERY well. You will definitely be seeing these again.. yum! I found some interesting stats I thought I would share while reading the Washington Running Report (which you should sign up for if you’re in the DC region and a runner because its free and has a lot of race info and other interesting stuff). Interesting stuff! Be back later! I stayed up way to0 late again last night because my boyfriend got home from work late and then we watched too much TV, so I woke up really cranky. I knew there was only one thing to bring me out of the funk and wake me up, a delicious breakfast. Presenting… Iced Banana Pancakes. Repeat steps 3-5 for second pancake. Take remaining banana (2-3 slices), add 1 tbsp nut butter and 2 tbsp milk, and microwave for 30 seconds. Eat and be in heaven. These were seriously sooooo good. Microwaving the bananas before putting them in the pancakes gets them really soft and makes the banana flavor spread throughout the pancake. The mashed banana, almond butter, and milk “icing” makes the perfect pancake topper and replacement for syrup. Plus, nut butter is amazing and always makes your meal stick your ribs a bit more. To make it prettier, garnish with berries. I’m going out for lunch today with a client to Bobby Vans. Should be fun!